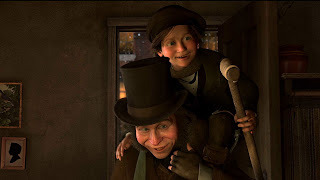 Robert Zemeckis’ motion-capture animated interpretation of “A Christmas Carol” is one of the most underrated adaptations of the classic story. When released in 2009, it underperformed at the box office and garnered tepid reactions from audiences and critics alike; two years later, I’d wager many are unaware of its existence. It’s not surprising that people avoided it when it first arrived in theatres, thanks to one of the most mishandled marketing campaigns I’ve ever seen. The trailers, which advertised the movie as an action/comedy, not only gave me no confidence in the film, but made me actively loath the idea of ever seeing it. I understood Disney wanting to be kid-friendly, but pandering to the lowest common denominator? Casting Jim Carrey as Ebenezer Scrooge? Shrinking Scrooge down to miniscule size for a fantasy chase through the streets of London? How could this be anything less than a disaster? This wasn’t director Robert Zemeckis’ first foray into animation, nor Christmas films. 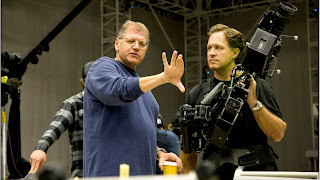 His 2004 film “The Polar Express” succeeded on one of the two fronts: narratively, it was a very strong Christmas tale, full of warmth and heart, but the ‘performance capture’ animation really didn’t work thanks to the “uncanny valley” effect – that is to say, when creating the human characters, the animators strived so hard for photo-realism that the differences between the CGI creations and real-life human beings were far more noticeable than in typical ‘cartoony’ fair, and the effect was unsettling. This problem was enhanced in “Beowulf,” a film that would have been awful in live-action, but was made worse by the downright terrible (and creepy in all the wrong ways) animation. Using motion-capture for “A Christmas Carol” just seemed like a bad idea – Zemeckis had in no way proven mastery of the technique. Perhaps he had just been using it in the wrong way, because the execution of motion capture in “Carol” is splendid. Zemeckis didn’t strive for photo-realism so much this time around; the characters look like cartoons, which makes it easier for our eyes to accept them. Scrooge himself is a fine example of this. He’s got a long chin and a hooked nose, and is visually one of the more effective screen portrayals of the character. 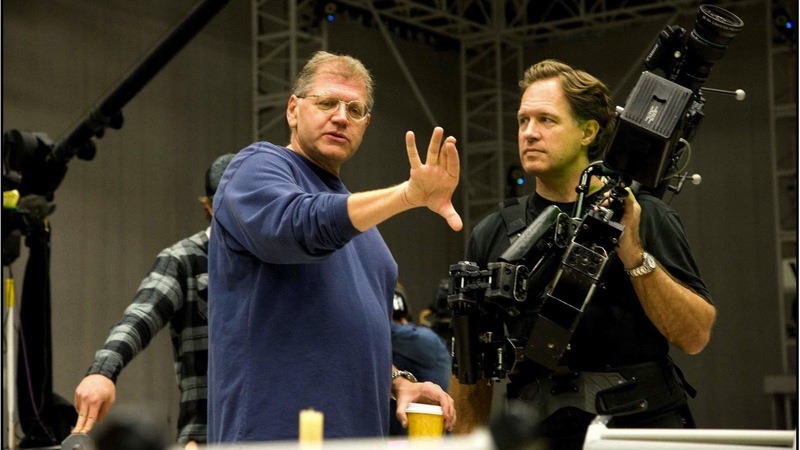 Some members of the cast look like their live action counterparts, but for the most part, Zemeckis takes a more stylized approach. The result is a beautiful looking movie, one that is incredibly detailed and visually rich. The animation is astounding from beginning to end, with only a few weak spots here and there. Zemeckis obviously understands the advantages of a visual medium, and instead of having a narrator tell us what Dickens said about Scrooge and London, he shows us what Dickens wrote through the animation. All the same feelings and emotions the book generates are created here, but visually. Along the way, Zemeckis adds many artistic flourishes that never change the meaning of Dickens’ work, but instead enhance it greatly. The visual element of the movie definitely gives it a leg up over many other film incarnations. Still, the visuals wouldn’t matter without a story backing them up, and the script (written by Zemeckis) is a fine specimen indeed. For the most part, it’s a very straightforward adaptation of the book: when Zemeckis embellishes or makes changes, he does it visually, which is a great choice. Many of the classic lines are represented here, and the dialogue is never updated to suit modern audiences. Furthermore, the script takes some of the darker parts of the book and enhances them. The concept of Marley wearing a scarf to hold his jaw in place or the Ghost of Christmas Present concealing Ignorance and Want under his cloak have never been illustrated in such dark, grotesque, and dare I say powerful ways on screen. As such, this is not a kid’s movie. Children of young ages probably won’t understand the dialogue or thematic material, and when the movie gets intense it doesn’t pull any punches. For adults, however, this is one of the most literate and meaningful retellings of the story. As I said above, Jim Carrey’s casting didn’t exactly fill me with confidence; he hadn’t done a good movie in years and I assumed Disney was just exploiting his fame. That couldn’t be further from the truth. 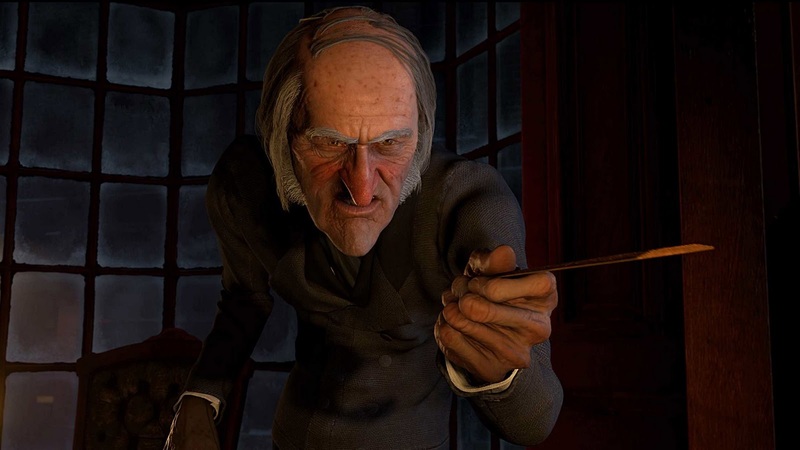 As Ebenezer Scrooge, Carrey gives one of his all-time best performances, and proves that his talents might just be wasted on comedy. 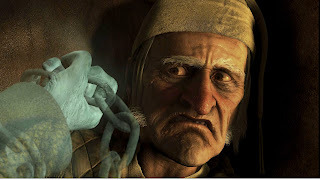 His Scrooge is an extremely bitter, frail man who has, for all intents and purposes, already died. His only links to the mortal world are the coins he grips so tightly. Carrey understands the character intimately, and plays the role pitch-perfect throughout. His best scene comes when we see a young Scrooge driving away his fiancée. Robin Wright Penn is excellent opposite him, but it’s Carrey who sells the scene on dramatic weight alone. 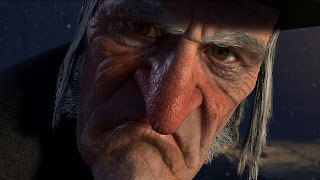 When Scrooge shouts and slams his fist on the desk unexpectedly, I fell in love with the movie: it’s that simple. 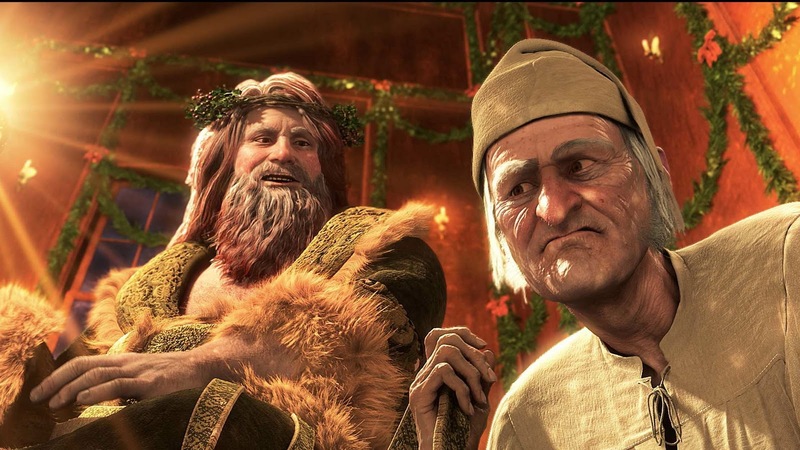 Carrey also plays the Ghosts of Christmas Past, Present, and Future (though Future has no dialogue) and is just as excellent in these roles. In fact, the film’s interpretation of the Ghosts may be my favorite in any “Carol” adaptation; all three are depicted very differently than what we’ve seen before, but they are uniformly exquisite, especially the Ghost of Christmas Present, who slowly ages as the scene progresses. Carrey gives the ghosts different accents and distinct personalities, and the viewer is never once clued into the fact that Carrey is playing all three parts. The wonderful Gary Oldman takes on multiple roles as well, playing both Bob Cratchit and Jacob Marley. These two performances are very different but also quite powerful. 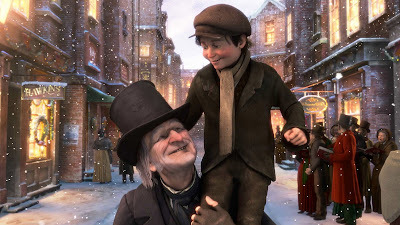 Cratchit doesn’t have much screen time, but the minutes Oldman has stick with you, and his scene as Marley is a show-stopper. Cary Elwes, Colin Firth, and Bob Hoskins all show up as well, each playing their respective parts with gusto. Zemeckis’ “Carol” has so many things going for it that were it not for one crucial mistake, I’d place it right in the highest pantheon of adaptations alongside the 1984 George C. Scott version. But that one mistake is a big one: the aforementioned third-act chase scene through the streets of London. It comes completely out of left field and is, from start to finish, utterly bewildering. It shatters the film’s carefully constructed tone and pacing, and decimates Carrey’s precise performance. Where Scrooge seemed to be a weak and frail old man, he’s suddenly riding through London on an icicle without breaking a hip. Why? WHY?!! This is one of the most pointless sequences I’ve ever seen in a movie, and it’s more than just a nitpick; were the scene a drive-by bit of randomness, I could live with it, but the chase goes on for at least five minutes, and it feels a lot longer. But that’s why DVD and Blu-Ray remotes have the fast-forward button, I suppose, and taking this scene out of the equation, Zemeckis and Carrey crafted one hell of a movie. Everything I love about the book is represented here, with all the subtext, metaphor, and deeper meaning intact. It’s the rare “Christmas Carol” adaptation that deserves a place among the annual December rotation of Holiday classics, and if you are one of the many viewers that overlooked it when it first came out, I highly recommend checking it out this season.